These question mark characters were over time becoming more and more infuriating every time I would launch the app. It seems that the majority of people I found online searching for the same thing were eventually settling on an application called “SyncTerm”. 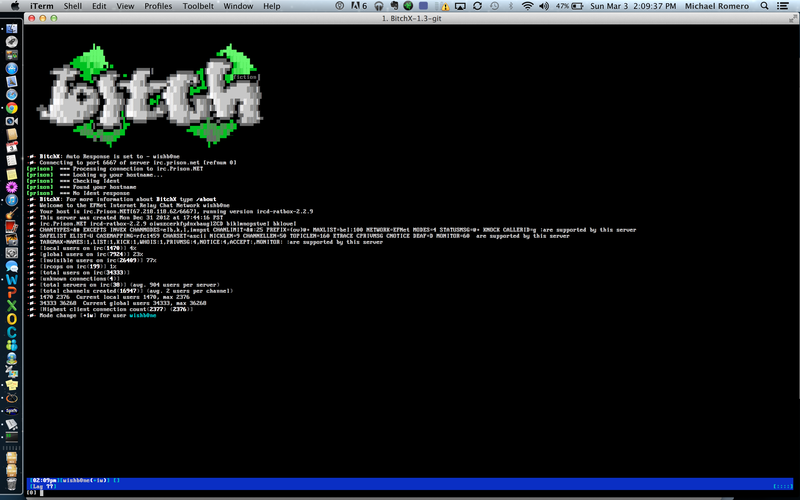 SyncTerm is kind of a hokey terminal emulator seemingly meant specifically to connect to BBS’s. On the plus side, SyncTerm DID manage to render the extended ASCII characters by default. HOWEVER – it does not support cut-n-paste, or a number of other standard features you would expect out of a terminal application. So this was a no-go for me. SyncTerm DID prove that extended ascii (line drawing) characters were possible to render on OS/X. 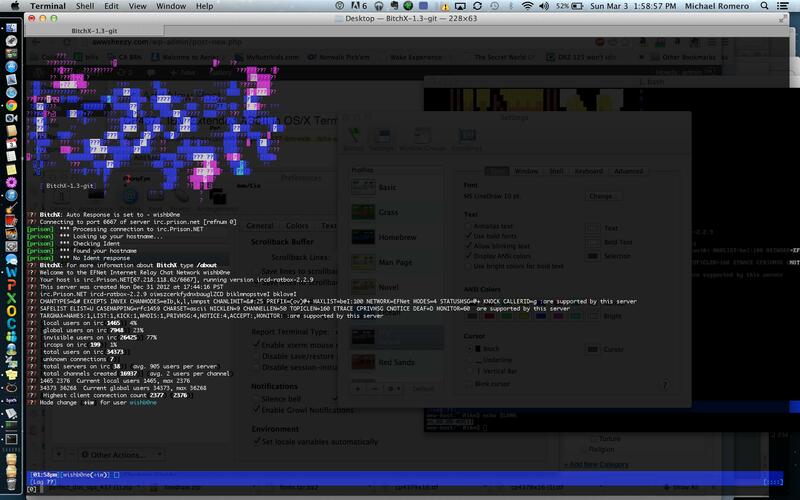 Ultimately, I ended up finding a way to get a terminal application called “iTerm” to do the trick. By default, iTerm does NOT render extended ascii. Instead, you have to perform a few steps in order to get it going. Step 3. Open iTerm, change a couple settings. Set the font for both “Regular Font” and “Non-ASCII Font” to one of the three fonts I’ve asked you to install earlier. I am currently using “11pt Perfect DOS VGA 437”. Under “Terminal Emulation” -> “Character Encoding” – change the encoding from the default (Unicode UTF-8) to “Western ASCII”. At this point, my iTerm was rendering the extended ASCII / line drawing characters as expected! Honorable mentions to a couple interesting projects I discovered during my efforts to resolve this issue go to the “Fink” project, as well as the “DOS Box” project.